Stewart Pringle reviews Action Plans – Selected Performance Texts, by Action Hero, published by Oberon Books. I’ve always liked Action Hero, and liked them instinctively. But I hadn’t realised quite how instinctive, or how remote from any attempt to unpick or properly interrogate their work, my liking was. Hoke’s Bluff just seemed self-evidently good. It exploded the linguistic commonplaces and rhythms of a specific kind of Americana, one that’s filtered through the mythological structures of the American High School, which had always seemed as remote but ineffable as the strictures of Ancient Sparta. It reformed them into strange looping shapes and re-performed them at one remove, constructing a kind of bi-directional queering of itself – too rough and spiky for its cornball inspiration, but too slick for its DIY performance art context. Likewise Slap Talk seems to satirise the absurd linguistic gaming of competitive negging, while the recent Wrecking Ball opened a shutter-eye into the world of complicity and consent in the terrifying Terryworld of hipster fashion photography. After reading Action Plans, they seem like far more. Where Ontrorend Goed’s book All Work: No Plays offered a series of blueprints for their performances, from which a company could – with the resources and timescales suggested – theoretically recreate Audience or A Game of You to traumatise their families and friends,Action Plans is more like a toolkit for the interpretation of Action Hero themselves. Walking through an Ontrorend Goed performance after reading All Work was a strangely distancing experience. Your mind can’t help comparing the corridors or actions with those listed and mapped out in the book, by revealing the mechanics of the productions, the company at once make them less absolute, atomised as they are into their component parts and decisions, and less threatening. It’s like taking a ride in a car after reading the Haynes manual. It never feels quite like the same car again. Conversely, though Oberon books have lavished the same standards of production and typographical freedom on Action Plans, which is if anything even more beautiful an object than All Work, this volume serves to increase and deepen an experience of Action Hero’s works and practise rather than compartmentalise and deconstruct. It begins with an illuminating introduction by Carl Lavery in the form of a lexicon, which takes a thematic, theoretical and alphabetical approach to their work as a whole. As a primer, it’s suggestive and sympathetic toAction Hero’s work, even where it’s a little too Cultural Studies-ish (B is for Baudrillard, P is for praxis, T is for Tate Modern Bookshop). It certainly lays some solid foundations for thought for those who might have mistaken the superficial attractiveness of Action Hero’s work for an underlying superficiality (*raises hand, sheepishly*). In a nod to the academic or to posterity that’s feels only half-serious, Hoke’s Bluff is annotated with production notes – the texts, films and websites Paintin and Stenhouse visited during their development period. There are moments of candour, one scene described as a last-minute rewrite when Action Hero realised that their own deconstruction of the American high-school drama itself failed the Bechdel Test. The scene they inserted to ensure a passing grade ironically sees the Wildcats cheerleading squad discussing the ‘Deadman’, another in a series of fictional moves of no-less-than-conventional absurdity. In the case of Frontman, which Paintin apparently found so uncomfortable to perform that it has been definitely retired from their repertoire (unless that too is a game Action Hero are playing with the notion of perpetual finale’s and inevitable comeback tours) the text has been annotated with fragmented memories from friends and colleagues. These locate it as an experience in time, as a thing that has happened and that may not happen again, and also offer a rejection of the totalising position of authorship within a volume of ‘collected works’. Action Hero are adept manipulators of cultural memory, and their presentation of texts here honours that. Hoke’s Bluff and Frontman and Slap Talk are a bit like an awful lot of things, they are packed with images, phrases and ideas which trigger spasms in the mush of mushed together cultural experiences. Even in Extraordinary Rendition and Wrecking Ball (which came too late to be included here), images of the familiar and the all-American, Top Gun in the case of the former and a pantheon of loli-chic images in the latter, compete with brutality or submission. Action Hero don’t use these devices ironically, but as component parts of the worlds their works describe. Here the texts are a ‘bit like’ their performances, they do not contain ‘all the words [they] actually speak on stage’. The longer scenes from Hoke’s Bluff are truncated; A Western would be more or less indecipherable without a prior knowledge of the piece, suggesting, rather than transcribing, the experience; Watch Me Fall is presented with a ticker-tape of narration against a collection of the images Action Hero gathered from the disposable cameras handed to their audience, a fragment of the archive of 10,000 or so images crowd-sourced throughout its dozens of performances. Frontman has been shorn of its song lyrics for reasons of copyright, performing a convenient redaction of one the one remaining layer of specificities in the piece. Best of all, Slap Talk dispenses with the neat page layout of borders and margins, with the cognitive impossibility of processing (or performing) its sprawling and repetitive six-hour script neatly transcribed as a text which folds into the book’s spine in minute, intractable print. The most telling piece of glossing or cross-referencing in Action Plans comes from Svetlana Boym’s The Future of Nostalgia, quoted over the pre-credits ‘Where Are They Now’ sequence that closes Hoke’s Bluff. It describes nostalgia as a ‘superimposition of two images – of home and abroad’, and states that ‘Nostalgic love can only ever survive in a long-distance relationship’. There is plenty that is not of love, or of nostalgia as we would conventionally understand it, in Action Hero’s work, and their most recent work in particular. But despite this, and despite it emerging from a relationship which is both personally and professionally close, there is something persistently long-distance in all of their plans and their works, a bifurcation between the remembered and the performed, the cultural and the actual and active, which Action Plans remembers and celebrates in both form and content. It’s another gorgeous book from Oberon, whose dedication to exploring the possibilities of print to do justice to their subjects is one of the joys of contemporary performance publishing – and to a greater extent even than OG’s All Work, it feels like an heroic extension of everything Paintin and Stenhouse have built so far. 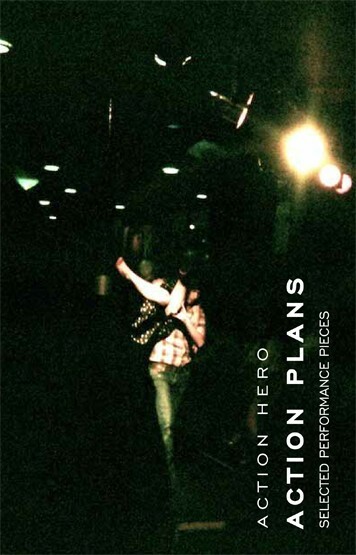 Action Plans – Selected Performance Texts, by Action Hero, is published by Oberon Books. Exeunt readers can 40% off Action Plans when using the code ONACTIONHERO on the Oberon website. Writer of this and that and critic for here and there. Artistic director of the Old Red Lion Theatre.